← Cully Young Farmers Project needs YOUR help! Whoops! I forgot to post this til now – sorry about that. 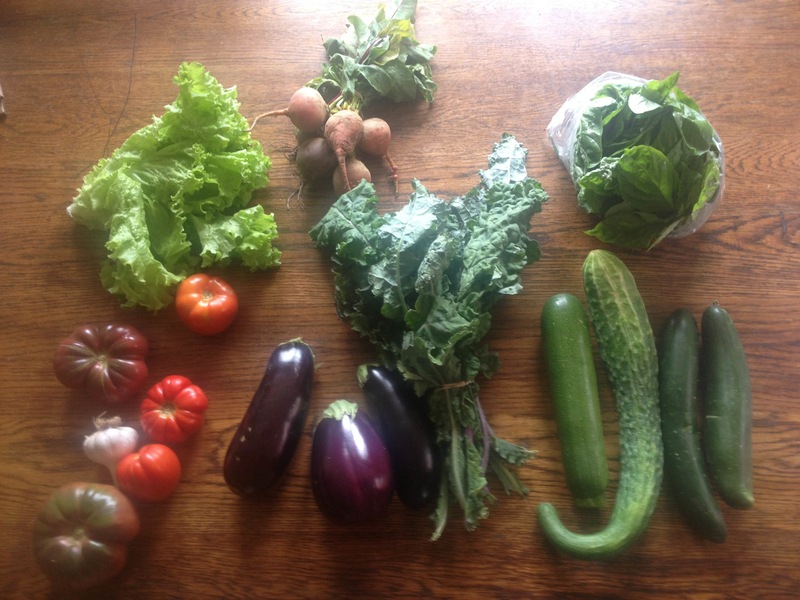 A nice summer share Monday: A good array of five tomatoes, 3 med/large eggplant, 2 regular cukes + 1 asian cuke, 1-2 zucchini, bunch of rainbow lacinato kale, head of lettuce (various types), bunch of beets, 1 head of garlic, and a bag of about 1/2lb of basil. A note on tomatoes: I do pick them a little underripe in the hopes that they will travel better not being too squishy. For full ripeness, let them sit out at room temperature (which is how they are best stored anyway – cold temps make them taste funny). When a tomato has a good bit of give to the gentle squeeze, it is ripe. Eggplant also likes to be stored at room temp, so if you have space on your counter or in a fruit basket or the like, put them there.